When some women enter a shoe store their heart quickens, adrenaline courses through their veins, and all else fades from consciousness as they walk among their beloved Prada and Jimmy Choos. That's how it is for me when I enter the children's section of Barnes and Noble. My husband was at a conference last night, so I took the girls out to dinner and then over to B&N for a little browsing. Perhaps you picture me sitting with the girls on my lap, reading them story after story. Nuh-uh. This is MY time. I ushered them to the train table where they played and happily tore apart the displays, and I lost my self in the latest kids lit. Little Rabbit wants to visit the circus but can't until he cleans up his disastrous playroom. Angry with his mother, he runs off and tries to join the circus. The ringmaster says he can join if he sells 100 tickets. Little Rabbit successfully sells the allotted amount by luring the animals to the show with the promise of seeing the meanest mother on earth, a "Mysterious Marvel of a Maternal Monstrosity." When Little Rabbit drags his (perfectly normal) mother on stage the animals turn on him and Mother Rabbit calms the crowd by promising them a better show: an "Emporium of Odiferous Oddities"... Little Rabbit's playroom! The story is clever and funny and the illustrations are amazing. I need to get a camera phone so I can sneak snapshots of the book at B&N, but in the meantime you'll have to check it out yourself. The illustrations are full-color, detailed, and gorgeous! At the end of the book Little Rabbit tells his mom he didn't really mean she was the meanest mother on earth. Her response? "I know. I'm the luckiest." Now that is a Mother's Day Book! My mother is a bookaholic. (Yes, I come by it honestly.) She has a kindle and gets most of her books digitally (isn't she chic? 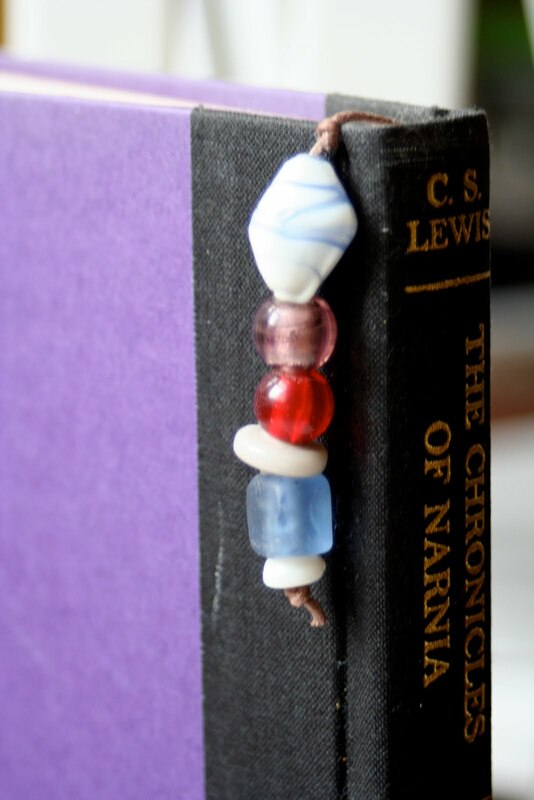 ), but she still gets good ole analog books from the library, so for mother's day we're making her a beaded bookmark. 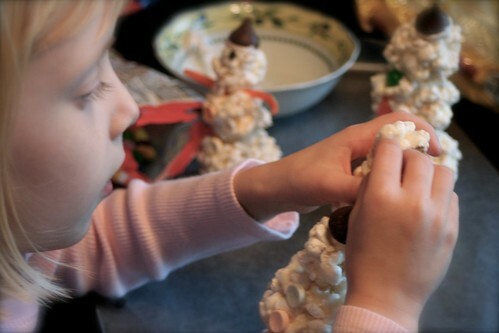 It's simple, cheap, and easy enough for your preschooler to help with. Here's how. 1. Tie a knot 3 inches up from the cord. 2. Add beads for about 1 1/2 inches. 3. Knot off as close to the beads as possible. 4. Measure 10 inches and tie another knot. 5. Add beads to this end for another 1-2 inches and tie off. 6. Trim both ends about 1/4 inch. 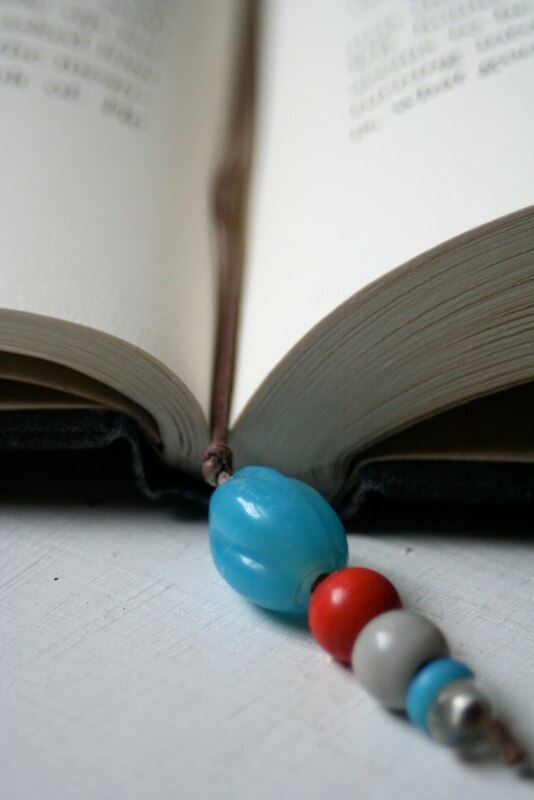 This bookmark will fit your standard 10 inch hardcover. If paperbacks are more your thing, just make it a little shorter. This is a great threading exercise for older preschoolers. E really enjoyed picking out which beads she wanted to add. When we were done, I printed off a little "Happy Mother's Day" message and glued it to half an index card. Then I wrapped the bookmark around the card and tucked it into a couple slits I'd cut. Now it's ready to be slipped into a Mother's Day card for the woman who taught me to love books! I have enjoyed looking at your blog. Thanks for stopping by mine for the Ultimate Blog Party. I am very sorry it took me a while to come see your blog. Hope you enjoyed meeting new people. Your blog looks very fun!! I will be back. My daughter would love making the bookmarks. Shiny beads are right up her alley! Great adaptation for your kiddo...I'm sure it'll be well received. I loved the beaded bookmarks.Well,do U have any idea how to make the bracelets using hemp knots?